The greatest joy that has come with every party is the experience to see what a child can accomplish! 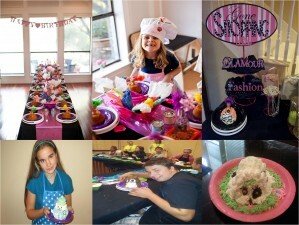 The success of Scribble Cakes – DFW Cake Decorating Parties evolved from a Grandmother’s love for her granddaughter, Katelyn. Kim’s daughter was at odds of what to do for her daughter’s 5th birthday. They had already thrown the typical birthday parties and really wanted to come up with something unique. Several weeks passed by and Kim’s daughter called in a panic. “Mom, can we still do the cake decorating party? I have searched and searched Dallas/Fort Worth and just can’t find something new for their age. Katelyn wants “Hello Kitty,” are you sure they can do it?” Kim assured her daughter that they could. The quest began to insure Kim had the right recipe to create a sweet party. It was tables, bakery supplies, oh my. Aprons, table cloths were on the buy. A lot of thought was put into the technique that they would apply. Soon the party date would arrive. The day had come and there were boys and girls at the birthday party, eager to dive into the activity at hand. Kim instructed the children on the plan. She walked them through step-by-step, since this was new. The kids were delighted at what they had achieved and the parents were in awe. That is when the questions began. How much do you charge for a party? Do you have different themes? It was all so exciting. Kim had never considered the concept as a business. She quickly gathered email addresses and let them know she would contact them with information. Kim stayed up all night from the excitement. She cooked up a business name, theme menu, conducted a cost analysis and prepared marketing material. The information was served to the parents the very next morning. To her amazement, the response was great! Four parties were booked the same day. It was a running start to a great new party concept. Since then, new themes continue to be added to the menu to keep Scribble Cakes the funniest ingredient of your celebration! Scribble Cakes – General Info. Party planning can be a lot of hard work – especially when you have a reputation for fabulousness like you do. Instead of dashing all over town looking for a new party concept, let Scribble Cakes customize the cutest party ever at the location of your choice within the DFW Metroplex. Kim and the Scribble Cakes crew were awesome to collaborate with for the pediatric patient & siblings activities room our organization, CoachArt, coordinated for the Scleroderma National Patient Education Conference last July in Gaylord, Texas. Since our non-profit is based in Los Angeles, researching activities led by organizations we weren’t familiar with was initially a challenge. But when we stumbled across Scribble Cakes, it was like a match made in heaven! Their gluten free cakes were great options for the patients and the owl design workshop was a big hit! Who knew so many teens (both guys and girls) would be that into frosting? The cake decorating session was by far the most popular activity that weekend, and we know the time spent making their creations was the highlight of the conference. If we were based in the Dallas area, we would definitely have Scribbles Cakes as one of our main partners, and hope we get to work with them again in the future! Kai, thank you so much. We enjoyed working with you and your team while in the Dallas area!! We had a Scribble Cakes party for my daughter when she turned 8. It was awesome! We had a Hawaiian theme and did flip flops for the girls and surfboards for the boys. The kids had a blast. I love that Kim brings absolutely everything we need and then takes away the mess. My kind of party!! Cassy, we appreciate you! It was our pleasure. We have a super sweet time and look forward to hearing from many of you! Kim brought all of the supplies and decor. Easy and fun, my idea of a perfect party!!! You are so kind. We had a wonderful time with the girls! We appreciate you. We had Scribble Cakes come to our house twice in one weekend! The first party we had the snowman theme and the second party we had the owl theme. Both parties were a success! The kids has so much fun decorating their cake. This party idea is a keeper! Anita, It was such a pleasure to be able to party with your family twice. Your girls and both sets of their friends were so sweet. I appreciate your support! Kim came to our school last summer and my children loved it. She did the cupcakes for every class and let them do the decorations. The little ones ate more of the icing than was put on the cake but they all had so much fun. They kept telling their parents and then parents came to me asking how to contact her. She will be coming to my school again this summer and we are all looking forward to it. Kim showed so much patience with these children while she was here it seemed like she was a member of our staff. Good job Kim and keep doing the wonderful work that you do! Can’t wait too! Thanks for having us back. We had Kim come over for my daughter’s 11th b’day and everyone had a blast. I recd emails from other Moms about how much their daughters had enjoyed and most said ‘it was the best party ever’. Kim is really a pleasure to work with. She is very organized and works with the child to decide on themes they want. She is very open to new ideas. We did boomboxes for my daughter’s theme, ut was her first time doing it but they were excellent. Rupi, it was so much fun to come up with an idea of how to make the boomboxes. I love it when children want a theme that we haven’t done before. It literally adds to the flair of our parties… Unique and Creative. All the young ladies at the party did an amazing job. Thanks for allowing us to share in her day! Kim did a cake party last month for my 8 year old daughter’s birthday. I was absolutely amazed with Scribble Cakes. Not only did Kim set up, clean up, and bring everything including decorations, she completely held the attention of 20+ 8 year old girls for two hours. The owl cakes were precious! I would definitely use Scribble Cakes again and highly recommend the party. Brenda, thank you so much! It was a joy to meet you, your daughter and friends. We had a wonderful time.